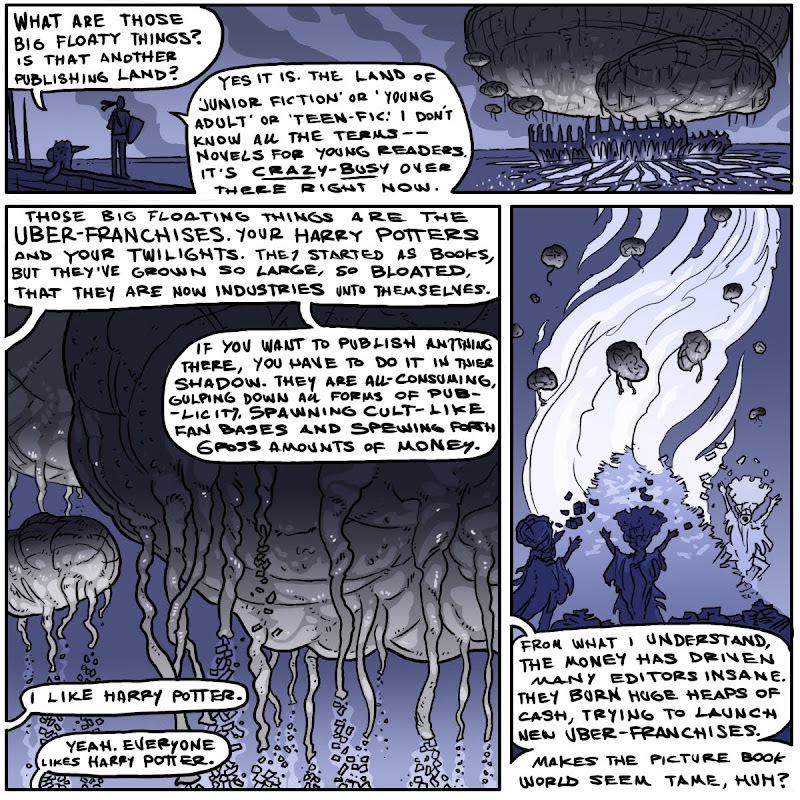 Your Land of Doom comic today crossed from the zone of brilliant into genius. Or from genius into brilliant, I can't decide which is better. 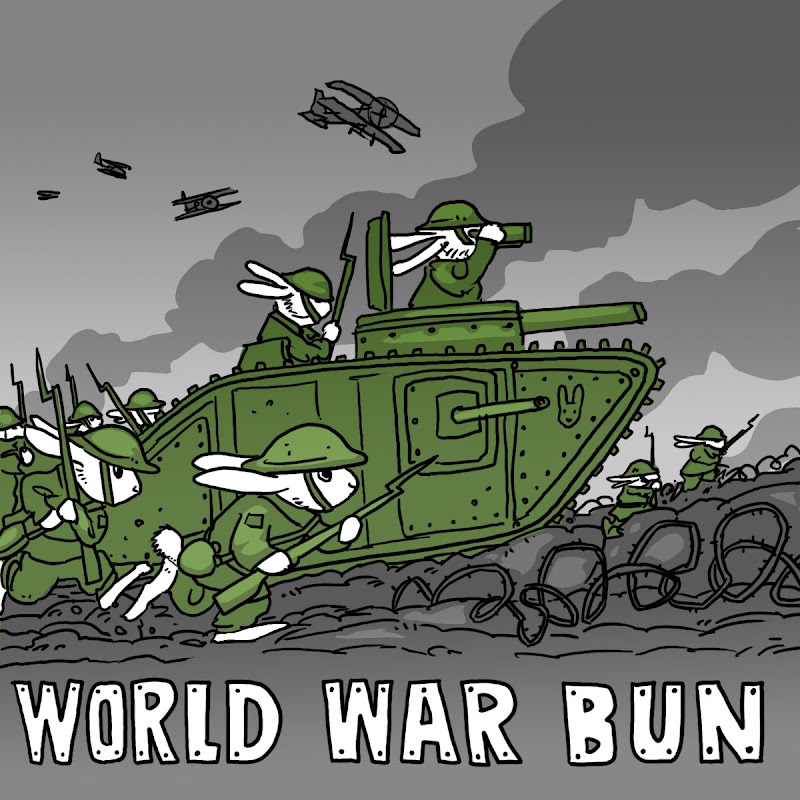 And World War Bun is definitely in the top 5 so far. Yes, let's do WWI with bunnies! Sorry I haven't been commenting. I would totally buy the Jester's New Clothes, Elephant of Surprise, and well, most of these books for my kids! jw--Heehee, thanks. I was a little worried it might come off as bitter (?) I'm a total outsider to that segment of publishing--Rapunzel has maybe a tiny bit of overlap there. But I'll be honest, I do not understand the wild popularity some franchises get. Totally insane. In my mind, publishing today should be more diverse and more interesting than it has ever been, with the internet out there allowing writers and fans to interact, blah blah blah. Instead, it seems to be LESS diverse than it has ever been. A total one-trick-pony show. Everyone wants a bestseller that gets turned into a movie that people sleep out for, leading to a line of t-shirts. Sounds like a drag to me. I'm sure I'm wrong, as an outsider to that segment, looking in. And by all means, don't lets start talking about "the state of publishing today" ugh, I'll leave that to other (more boring) blogs. I just wanted to draw ol' J.K and Stephanie as gross, tentacle dangling gas blimps--that's the real heart of the issue. JDG--I liked your comment yesterday about your house being full of glass top furniture. I knew one family growing up that had a glass top coffee table. It was completely fascinating to me. But, yeah, that would put a damper on the "No Touch the Ground" game. Now I'm going to be worring about bunnies all day. I hope they are impevious to mustard gas.